You are here: Publications > Der heilige Anker..
Corsica - since millenia the breakers roll onto the shores of the fourth largest island of the Mediterranean. And since man went to sea many ships were overwhelmed by the forces of nature over and over again. The knowledge of archaeologists about the construction and use of ships in Antiquity is still limited. 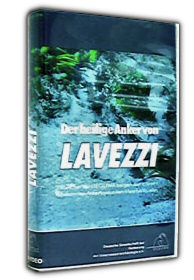 The diving pioneer Wolfgang Schultheis in collaboration with the archaeologists Federico Foerster Laures († 1988) and Alfred Zeischka († 2005) and other experts of the DEGUWA made a sensational find: The "Heilige Anker von Lavezzi" (=Holy Anchor of Lavezzi). This documentary accompanies the archaeologists on their exiting work under and above the water. The 20 minutes VHS (in German) is presently available for 10 € at biovision Filmproduktion. More information: info@biovision.tv.